Delicious, pure, cool, clear water. Elegant design. Commercial grade. 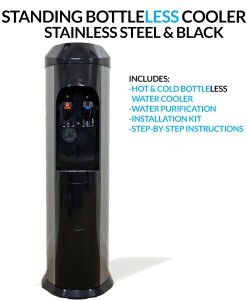 Those are just some of the things you get with the MJP BottleLess water cooler. The MJP includes everything you need – our high capacity Twist-Off water purification system, installation kit, and step-by-step instructions. 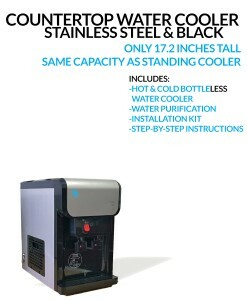 Our coolers are perfect for any home or office up to 30 people and are engineered to withstand heavy use. The MJP is available in two colors: Black or White. 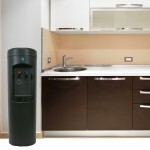 The BottleLess Direct MJP Water Cooler is a high capacity BottleLess water cooler (sometimes called “point of use” cooler) made for offices, warehouses, factories, waiting rooms, gyms – and even homes. 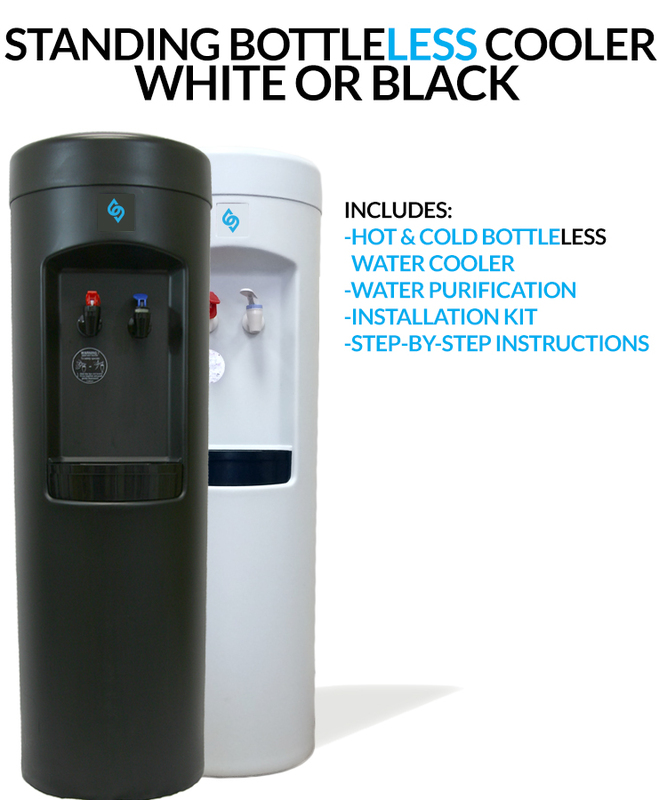 The MJP cooler comes with everything you need for pure, delicious water – our high capacity Twist-Off water purification system, installation kit, and step-by-step instructions. The cooler uses a standard electrical outlet and is perfect for typical usage of up to 30 people. Hot & Cold: The cooler has instant cold and child-resistant hot water faucets. 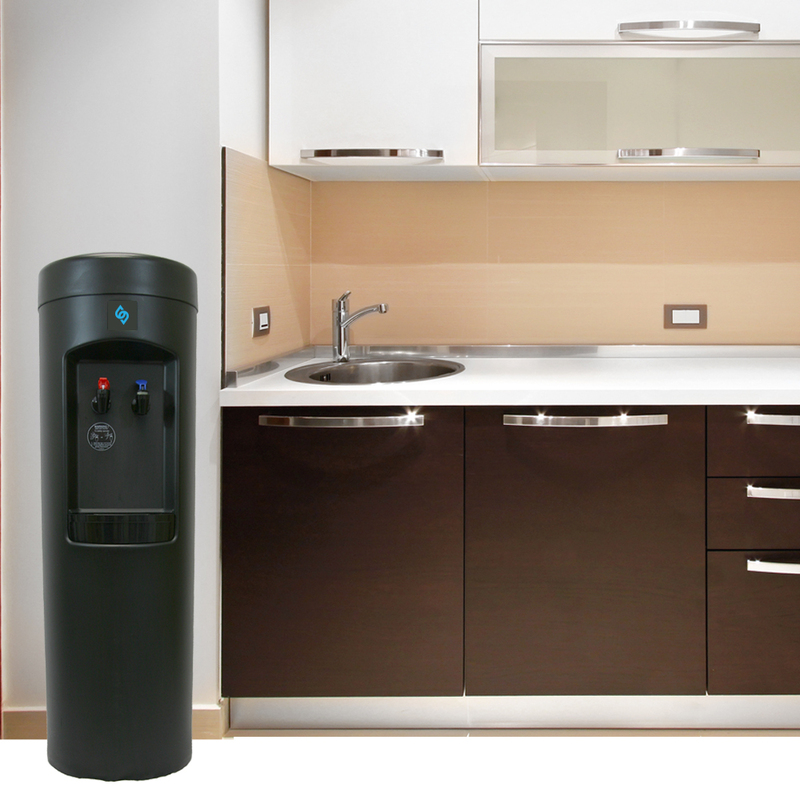 The two internal, sealed, 100% stainless steel reservoirs keep your purified hot and cold water safe from external contaminants. The cold water reservoir holds 1-gallon of ice-cold water. 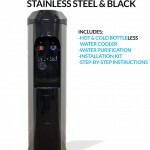 The hot tank holds 1.2 liters of steaming water, dispensed at 180 degrees. External: The one-piece, ABS, UV-resistant cabinet is easy to clean and will withstand heavy use. The drip tray lifts out and is dishwasher safe. 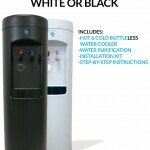 The cooler is available in black or white to complement any style home or office. It measures 38″ inches high x 12″ inches wide x 12.5″ inches deep. Internal: Equipped with a top quality, quiet 1.7A compressor. 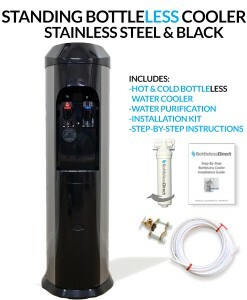 Components are lead free as defined by the Safe Drinking Water Act, and the Lead Free Contamination Control Act. CSA and Energy Star Certified: The cooler is sanitized and sealed at the factory. 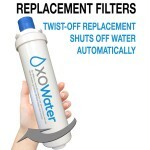 Filtration: The Twist-Off purification cartridges are the ultimate “user friendly” filters. Replacement is completed in seconds. Just detach the filter body from the permanent head with a twist of the wrist. The new filter cartridge is just as easily replaced by threading it into the head. The Twist-Off system automatically turns the supply water off when the cartridge is turned. No drips. No hassles. This 1-micron filtration system is independently certified for 1,200 gallons of use for chlorine, lead, cysts, bad taste and odor reduction. That’s the same amount of water as 240 of those big 5-Gallon bottles! This filter has been tested to NSF performance Standard 42 and Standard 53. Installation kit: The kit includes a stainless steel saddle valve and 25′ feet of food-grade, flexible ¼” waterway. You can see more at our cooler features page.